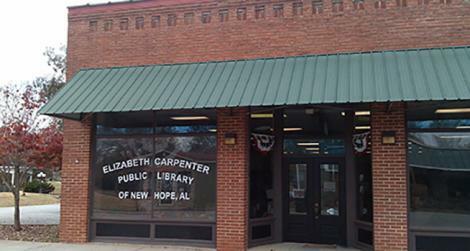 Welcome to the Elizabeth Carpenter Public Library of New Hope. Our library was established in 1988 in the southeastern Madison County community of New Hope. We are located in the center of the community in a historic building that was the former home of the Butler Brothers Hardware Store. The building is listed on the Madison County National Register of Historic Places and also houses the City of New Hope offices and the police department. New Hope Public Library has over 17,000 books, DVDs, audiobooks and music CDs. Services offered include five public computers with internet access, Wi-Fi, faxing and scanning. A Notary Public service is available free of charge in the City Hall offices next door. A variety of programs are offered for all ages, including storytime for pre-schoolers, Clever Readers Book Club for children 8-12 years old, Chatterbox Book Club for homeschool families, knitting classes, craft classes, a monthly teen writing group (WHoP--Wreaking Havoc on Paper), and informational programs. Read more about the New Hope Friends of the Library. Follow I-565 east out of Huntsville. Road will change from I-565 to Hwy 72 East. Follow Hwy. 72 for just under 13 miles into Gurley. Turn left onto 1st Street, and turn right onto Walker Street. Library is on your left.